This Christmas tale attempts to replicate in modern times the basic story of the Nativity in just about every way except for having a divine birth. We have the young girl, Mary Jo, traveling and finding no room in the hotels. We find shelter in an apartment above a barn, surrounded by sheep, oxen, horses and a camel. We've got her brothers...three of them...last name Wyse...carrying presents of gold, incense and perfume...trying to find her. We've got all kinds of Good Samaritans acting as angels of mercy. We've even got a young child who received a drum as a present who wants to play for her. Like Mary Higgins Clark and her daughter Carol, Debbie Macomber gives us a new Christmas story every season. All are light, spirit-lifting, and easy to read. This one is no exception. I enjoyed it! I envy Debbie Macombers creativity! Who else would come up with the story of Mary Josephine Wyse and the 3 Wyse brothers! Mary Josephine comes to Cedar Cove looking for the father of her unborn baby. There is an angel named Grace, a stable with a camel, donkey & sheep, and 3 Wyse men come together in a delightful story. I especially enjoyed the "3 wise guys" the suposedly helpful brothers of the main character...I greated a gift basket for our local library --with this book as the focus and a variety of Christmas items mentioned in the book to go with it,,,It was great fun and brought the library a donation of $40.! Mother-to-be Mary Jo Wyse finds herself stranded in Cedar Cove WA on Christmas eve, searching for her baby's father. He isn't there. Which leaves her pregnant and alone. And there's no room as the local inn! Grace & Cliff Harding offer her a room over their stable (which houses a donkey, camel, sheep and horses to be used in the church's Nativity Pagent). She goes into labor on Christmas Eve surrounded by caring people. Baby Noelle is born shortly thereafter her brohters (the three Wyse men!) arrive with gifts. The story was predictable, the characters involved were not. In typical Macomber fashion, she added folks to the growing cast. It was a decent story, around the holidays I might have liked it more. A simply delightful Christmas story and one that as you read it you discover that you have read it somewhere before. Mary Jo Wyse is about to have a baby and the father is nowhere to be found. She goes off to his hometown to find him and there meets some wonderful people who try and help as much as she can. It is also Christmas Eve. She had come across from Seattle on the ferry to the small town of Cedar Cove and now is much too tired to return that night but there is no room to be found anywhere. A woman who befriends her lets her stay in an apartment above the garage of her home, a garage that is currently housing some animals from a Nativity play. Another delightful book in the series. This one was shorter timeframe and focused on one family. Summery: Mother-to-be Mary Jo Wise arrives in Cedar Cove on Christmas Eve, searching for her baby’s father. David Rhodes had said he’d be in town. But he isn’t. Which leaves Mary Jo stranded, pregnant and alone. And there’s no room at the local inn . For some reason I’ve never read Debbie Macomber. I have always meant to read her but never gotten around to it until now.I got a copy for one of the people I was Secret Santa to and it made me finally go and check out a copy from the library. A Cedar Cover Christmas is my first visit with the folks in Cedar Cove and I will be back for more soon. Such a delightful read. The Cedar Cove series are always like that. Such similarities to the first Christmas: the 3 Wyse men, they got lost, saw the fireworks(star),etc. A Sweet story, nice for the holiday season. This is my least favorite so far of all the Cedar Cove books. The entire Christmas theme seemed entirely too contrived, particularly the Wyse men. 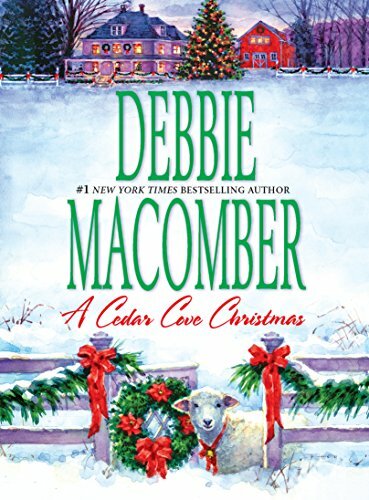 I have read other Debbie Macomber Christmas books that were enjoyable. This is clearly not one of her best efforts. An entertaining holiday story although there was very little romance. The plot was fun and the action interesting as we discover all the similarities to the seasonal story. Mary Jo is nine months pregnant and looking for the father of her baby when she has a dizzy spell and paramedic Mack is called. I really liked that Mack is a character we have previously met. I think David Rhodes is great 'bad guy' and was interested the trouble he was causing his family and others. I didn't really care for the Wyse men, and think the last part of the book felt a little forced.